The Red Balloon: a portrait of a boy and his relationship with an everyday object of fascination, a large red balloon: colorful and striking enough, especially against the grays of the Paris setting, that it becomes an object of fascination for us, too. The balloon starts as mere window-dressing, a prop that distinguishes the boy from his surroundings, but it seems to take on sentience as the movie goes on. This is true for us as the audience, and it follows that this is what is happening for the boy, as well. I didn’t know they made balloons this red, or this big… maybe any balloon of this color and size would turn out to be sentient and loyal. I don’t know. I’ve never been in the presence of such an awesome balloon. Lamorisse’s camera maintains a medium distance, keeping company with the boy and his balloon without crowding them. This is never a close-up per se, but it seems to act like a full-body close-up, focusing us on the boy’s actions and personal space, and decontextualizing him and his immediate surroundings. We travel with him, and we get to know him as a friend; in a sense, we identify with him, but we’re never forced to adopt his perspective. The film is at its best when we are standing on a hilltop with the boy (who I will henceforth refer to as Pascal, since that’s the actor’s real name), or running through narrow streets with him to escape from a gang of older boys, or waiting in a deserted courtyard to enter an imposing school building. At these moments, we share Pascal’s everyday experience of the world, frantic, nervous, and hopeful as it is. The balloon doesn't seem to wake up immediately; whether it remains truly inanimate for a while, or it just hasn't become comfortable with Pascal yet, it appears to start out as a mere thing. It seems to be Pascal's concern for the balloon's dryness during the rain that actually turns it from a toy into a companion. It also spends some time playing with Pascal, establishing some dynamic to their relationship: when he tells it to obey him, it taunts him a bit, and only falls in line when he seems to give up and start walking away. Even following him, it plays tricks on him, hiding and forcing him to come back and look for it. This give-and-take is a playful ritual, a chance for Pascal and the balloon to establish themselves as peers, rather than strictly as dominant and submissive. 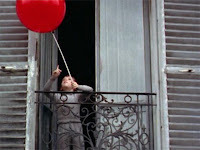 The framing and staging of The Red Balloon is playful, as well, with simple shots rotated just slightly on the Y axis. In this way, Lamorisse brings a hint of depth to shallow shots, and a bit of tilt to his horizons. The film is less "diagonal" than slightly tilted, its scenery a sequence of layers creating almost-parallel lines. This creates a minor tension between the roundness of the balloon and the structure of the background, its order undermined by imperfection. This is a world of discovery, simple but slightly disjointed, seen through a camera that's personal, but not pushy. The Red Balloon reminds me of another children's film, this one from my actual childhood. This is The Snowman, a 27-minute animated short directed by Dianne Jackson, released on the BBC in 1982. Like The Red Balloon, The Snowman is about a child wandering landscapes both familiar and unfamiliar, in the company of an anthropomorphized object that becomes his friend. In The Snowman, the boy (James) creates his snowman during a blizzard, and at midnight, at awakes and befriends him. James shows the snowman around his house, admiring the Christmas lights, scaring the family cat, and trying on clothes, makeup, and false teeth. After the snowman shares James's fascinations, it takes the boy out into the snowy world, and together they fly into the night sky and cross the countryside in a sequence not unlike Aladdin and Jasmine's explorations on the magic carpet. Eventually, they reach the North Pole, where they have a Christmas celebration with the animals and the spirits of the forest. The similarities are fairly obvious... both stories highlight the power of a child's imagination, and the ability of the young to see life in everything around them. Both hinge on a scene where the magical companion carries the child away into the sky, and both end bittersweetly. 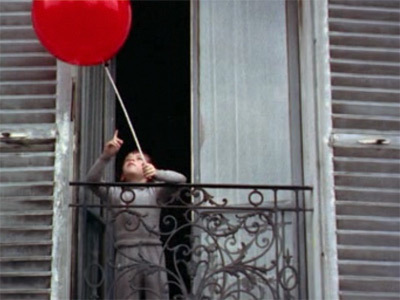 The Red Balloon's "flight from reality" scene has been criticized as too convenient, perhaps because it is downplayed almost to the point of being undermined; Pascal's deliverance is too easy, and we never see where he goes. The Snowman, on the other hand, contains one of the most sweeping and compelling flight scenes I've seen in any movie. It represents an unfolding of the endless world before the child's imagination, and it evokes all the mystery that the untracked landscape has always held. This is symptomatic of a difference in tone between these films, a point of worthy comparison: both are playful, open-ended tales embodying the spirit of childhood, but they manifest this mentality differently. The Snowman undoubtedly takes itself more seriously, celebrating childhood in a more sentimental way and probing the young imagination with more reverence. 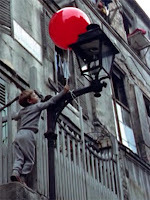 The Red Balloon is playful and enigmatic, as well, but it has a touch of teasing and slapstick. Having seen my first movie by Jacques Tati a couple months ago, I can see the relationship between the two French films: the silliness in the face of authority, the power that the directors give to subversive humor. Where The Snowman is a film about affection and curiosity, The Red Balloon is a film about loyalty and mischief. 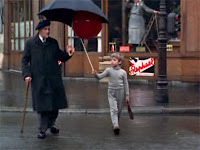 The endings actually provide the strongest thematic diversion between the two movies... in The Red Balloon, the world of imagination - represented by the balloons, in all their color and unpredictability - offers redemption, celebrating Pascal and carrying him away from the cruel tragedy of the real world. The final tragedy in The Snowman is more personal, more intimate, and inescapable, the cruelty of reality reasserting itself in the childhood fantasy. 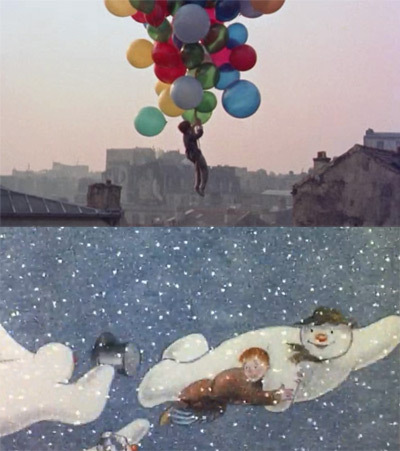 In a sense, these two movies offer opposing arguments: The Red Balloon is about holding onto your childhood, and The Snowman is about celebrating it in light of its inevitable loss. Differences aside, the broader common theme is one of tension between an outside world, sometimes beautiful and sometimes hostile, and a mysterious inner world where one can, in a certain sense, forge a friendship with oneself, and thus with the rest of the universe. I would suggest that this has to happen in children's films because it's a psychological leap that must happen through a child's eyes. Pascal and James may simply be imagining their adventures, but they're also making the larger leap of discovering something in the world they can love, via the intermediary of an inanimate object brought to life. The literal, everyday reality of adults and cities hasn't yet taken over these boys' perception, and the whole universe becomes an interior space where the child can learn to communicate with him or herself. These are beautiful landscapes without context, necessity, or "Other"-ness, and it's a place I hope to return to every once in a while, when I need to escape from anxiety, obligation, and intellectualization. I have to agree whole heartedly that the Red Balloon offers hope, a celebration of innocence long-lost in adults. The final scene where Pascal is carried away solidifies our ability to fly away or create our own reality through creatiity an imagination. I have not seen Snowman, but I appreciate your comparison and will surely look into it as it is through learning other views that we learn to appreciate what we have. As a children's book writer an illustartor I am, of course, biased to offer hope in light of despair. Thank you and I am looking forward to reading more of your reviews.